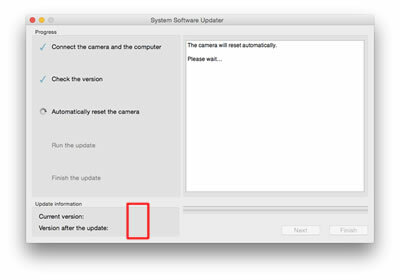 If the current firmware version is 1.30 or higher, the camera does not need this update. 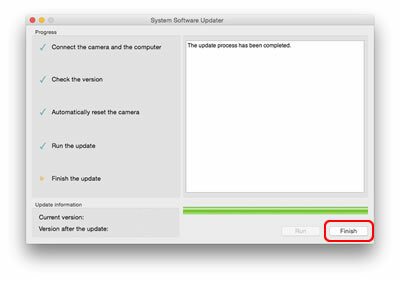 WARNING: Do not choose About This System Software Updater from SystemSoftwareUpdater Menu. Doing so may cause the updater software to crash, especially while updating. Mac OS® X version 10.7 - 10.11. Download the Update_DSCRX10M2V130.dmg file to a temporary or download directory (please note this directory for reference). 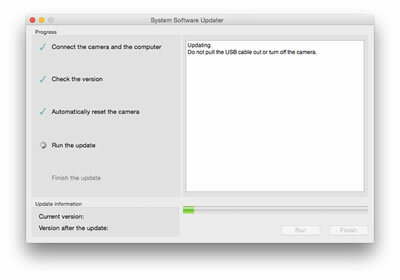 Go to the directory where the file was downloaded and double-click the Update_DSCRX10M2V130.dmg file. At the Password prompt screen, enter the Username and Password for the administrative account, and then click OK.
At the Menu screen, use the Control Wheel to select Setup, then 3, then USB Connection, and then ensure that Mass Storage is selected. Note: On the camera LCD monitor, USB Mode is displayed. 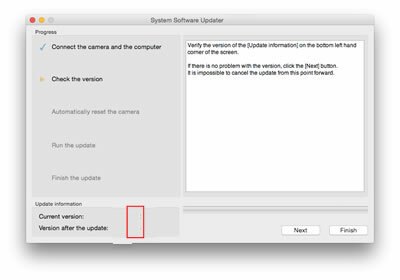 Note: If the Current version is 1.30, this update is not needed. 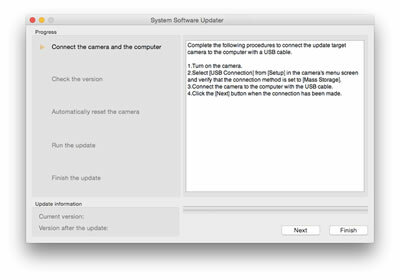 Stop the USB connection, and click Finish, then remove the battery pack and/or AC adapter and restart the camera.